Every city has its warm cultural corners. In Thunder Bay, one of the oldest and most famous is Westfort. The community grew up around river traffic and the railway, a home for working families. They built their own busy downtown complete with clothing stores, banks, restaurants, a hotel, professional offices, pharmacy and a food mart. Today, Westfort remains a self-contained shopping district with all the amenities. In fact many Thunder Bay residents will travel across the city to frequent its unique stores and shops. In this enviroment Westfort Foods has thrived as being a leader in the community, while maintaining that friendly "small town" service our customers come to expect. Established in 1998, by local business owners, we have supported many local events and charitable organizations. Westfort Foods continues to provide stable employment for many families including several students who are pursuing higher education. Rob is life long Thunder Bay resident, who has lived in Westfort for the past 20 years. Rob is one of the founding owners of Westfort Foods and is committed to providing a convenient shopping experience for his customers. 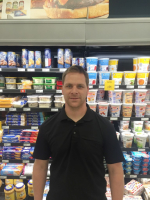 Jeff started as a stock clerk for Westfort Foods in 1998, while completing high school. Jeff joined the ownership group a few years later and has enjoyed success managing the inventory and the day to day operations of the business. Earl has over 35 years of retail grocery experience. His leadership, integrity, and dedication to the store and his customers are second to none.